I LOVE this... a lucky buy on TradeMe. I would love to have more of this pattern if anyone sees it around, please let me know and I will pay up! In particular I am missing one desert plate and two cups and saucers. Such a serene and gorgeous pastel pattern. (am I gushing a bit here - well yes!). This pic has already featured on my FB so most of you will have already seen it. 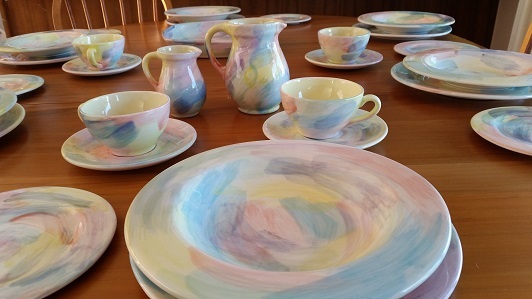 Christine Harris and a business partner established Studio Ceramics in 1991 and she left in 1995. 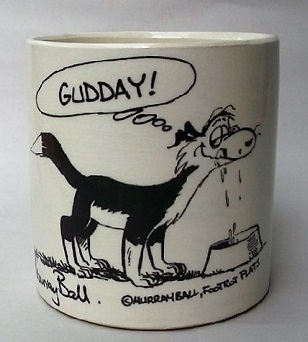 Studio Ceramics retained the rights to her designs so it is possible this was made after she left. It is totally 1990s at any rate. I'll keep an eye out.... this looks amazing, I've not seen the pattern before. One of the hamilton op shops seems to get bits and pieces of different nz pottery but sometimes the prices can be above average.